We’d love your help. Let us know what’s wrong with this preview of You Are Here by Dawn Lanuza. You Are Here is Dawn Lanuza’s newest collection of contemporary poetry that lends itself to the idea of giving ourselves second chances. These self-healing poems and words draw on central themes of self-love, self-discovery, an Growth and change—two powerful anthems resonate throughout this collection of poetry and prose that will leave you feeling emboldened and empowered. To ask other readers questions about You Are Here, please sign up. While I was reading this latest book of Dawn Lanuza, in the back of my mind, I thought that several of the poems and prose are really meant for me because of how I could easily relate myself to them. I felt that this anthology was written or dedicated to me by the author because I could connect to over half of the content. There are a lot of notable and relatable poems included in this collection, and I know that a lot of women, especially those who have the same age as I am, will love this seco While I was reading this latest book of Dawn Lanuza, in the back of my mind, I thought that several of the poems and prose are really meant for me because of how I could easily relate myself to them. I felt that this anthology was written or dedicated to me by the author because I could connect to over half of the content. There are a lot of notable and relatable poems included in this collection, and I know that a lot of women, especially those who have the same age as I am, will love this second poetry book of Lanuza. You Are Here is a poetry collection about relationships, love, vulnerability and self-reflection. Majority of the poems are well-structed, melancholic and heartfelt. The ones I can relate to are The Art of Eating Alone (precisely me), Grow and A Message. No rating because I think this will be great for a lot of people, but this writing just isn't doing anything for me. I got about halfway through before giving up. You Are Here is my second Dawn Lanuza poetry book, I have read How It Starts as my very first read. At some point in the book, I thought that some felt really familiar. True enough those works were already featured in from How It Starts. You Are Here is a collection that deals with love; in partner, self, opening up, accepting and getting used to being a grown-up, as we Millenials call it adulting. I find the introduction, not for my liking but as I go through the middle and last pages I find the You Are Here is my second Dawn Lanuza poetry book, I have read How It Starts as my very first read. At some point in the book, I thought that some felt really familiar. True enough those works were already featured in from How It Starts. I find the introduction, not for my liking but as I go through the middle and last pages I find the pieces calling me in, projecting a stronger voice of fierce, fearlessness and accepting. It tackled more on the specificity of the impact of society on one’s mental health, physical pain, peer pressure or the standards set out for us to believe, to comply with. Copy provided by Andrews McMeel Publishing in exchange for an honest review. All views and opinions are my own and don’t necessarily reflect the author, the author’s work, the publisher, nor any other group of people, nor receive any monetary compensation for doing this review. All quotes may not be exactly as it is in the final release of the book. This collection of poems is just okay. The themes this book deals with are current ones such as finding the right person and not settling if you don’t want to, even if society is urging you to do it. It also talks about our body image compared to society unrealistic standards and chronic pain. There's also a section dedicated to lost/ended love. Among all the poems not a lot of them stood out to me The ARC of this book was provided by the publisher via NetGalley in exchange for an honest review. First, I'd like to thank NetGalley and Andrews McMeel Publishing for this gorgeous poetry collection. This is the second poetry collection written by Dawn Lanuza. And I have to say that some of them resonated with my so much. Growth and change were the main subjects in this collection. And this was exactly what I needed right now. Now, there was a thing that I didn't quite understood. There was a blank page after every poetry, but despite the fact they each had a title, there were some who didn't. First, I'd like to thank NetGalley and Andrews McMeel Publishing for this gorgeous poetry collection. Now, there was a thing that I didn't quite understood. There was a blank page after every poetry, but despite the fact they each had a title, there were some who didn't. And I didn't understood if they weren't complete yet or maybe that was the point. and the ride just won't stop. you're not supposed to turn around. And there are many more that I bookmarked and loved. This collection comes out on 12 February 2019. So, if you like these paragraphs and are curious of the other poetry, make sure to buy this. I was first attracted to this book by its pretty cover. I was so glad to see it’s written by Dawn Lanuza, because I’ve been wanting to read her works for some time now. This collection of modern poetry is meant to be read slowly and savored. These are little vignettes reflecting on love and loss. It can be heartwarming at one moment and heartbreaking the next. It’s all about healing and letting go. I also felt like a trusted friend is talking to me. I was comforted by the messages of body positi I was first attracted to this book by its pretty cover. I was so glad to see it’s written by Dawn Lanuza, because I’ve been wanting to read her works for some time now. This collection of modern poetry is meant to be read slowly and savored. These are little vignettes reflecting on love and loss. It can be heartwarming at one moment and heartbreaking the next. It’s all about healing and letting go. I also felt like a trusted friend is talking to me. I was comforted by the messages of body positivity and self love. I can compare this reading experience to drinking hot brewed coffee during a rainy night, surrounded by soft pillows and a warm blanket. As the title promises, the reader is compelled to look at oneself, and recognize where you are right now in your life. It reminds us that we should all learn to love and accept ourselves during our own journeys, no matter where we intend to go. An ARC ebook copy of this book was provided by Andrews McMeel Publishing via NetGalley in exchange for an honest review. There is no easy way to say this: Your Are Here is not for me. I tried, I sticked to it until the very ending, and I just couldn't swallow it. However, there are good points to it: it is a short and fast paced read (I read it in a sitting), and there is some wisdom and nice sentences in there. Nevertheless, I felt that the book heavily needed editing. A lot of editing. There we An ARC ebook copy of this book was provided by Andrews McMeel Publishing via NetGalley in exchange for an honest review. Nevertheless, I felt that the book heavily needed editing. A lot of editing. There were some major mistakes in the use of certain words, because the real meaning they have didn't correspond to what the author wanted to say, they didn't fit in the situation and context (for instance, using "solitude" when she meant "silence"); and I felt really confused at times by how she constructed the situations in the poems. There was situational and contextual inconsistency, contradiction and incoherence throughout individual poems that would've been easily mended by an editor. Also, this really felt like someone's first attempt at writing poetry. I think Dawn Lanuza has to write and rewrite and find better mentors and people who help her grow in her writing. Many of the poems felt like rewritings of poems I have already read by other people. In all the book I only found four sentences worth highlighting, which genuinely felt fresh and new. Moreover, her style doesn't fit what I like reading in poetry: the rhyme in some poems felt forced and superfluous, not adding any value to the poem. I couldn't wait to read this book and as soon as I got an eARC off Netgalley and read those first lines, I knew I would enjoy it. This is a collection of poems that explore, love, self-love, relationships and awareness. There are an array of poems that explore feelings of joy, uncertainty, fear, love, loss, hope -and the fragility of life. Some of my favorite poems are "Only if you must," "Staying is your choice," and "The tale of the girl." Love the simple black and white illustrations at the b I couldn't wait to read this book and as soon as I got an eARC off Netgalley and read those first lines, I knew I would enjoy it. This is a collection of poems that explore, love, self-love, relationships and awareness. There are an array of poems that explore feelings of joy, uncertainty, fear, love, loss, hope -and the fragility of life. 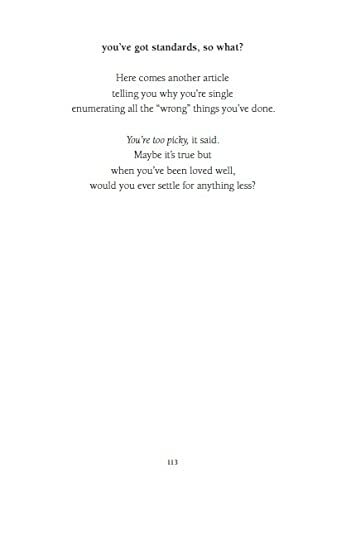 Some of my favorite poems are "Only if you must," "Staying is your choice," and "The tale of the girl." Love the simple black and white illustrations at the beginning of each section of the book. I have read a few poetry books this year that I didn't enjoy. And I can say that this book is one of my great reads this 2018. What makes it great is that it captured my emotions on what went through and is currently what I'm going through. It talks about relationships, heartbreaks, self-healing, self-love, self-discovery, etc. It is quite empowering in some ways, and I really felt that. Her poems are all easy to read and understand, and not at all trying-hard. You Are Here is a great book that I I have read a few poetry books this year that I didn't enjoy. And I can say that this book is one of my great reads this 2018. What makes it great is that it captured my emotions on what went through and is currently what I'm going through. It talks about relationships, heartbreaks, self-healing, self-love, self-discovery, etc. It is quite empowering in some ways, and I really felt that. Her poems are all easy to read and understand, and not at all trying-hard. You Are Here is a great book that I really liked and would recommend to fellow readers. And the first read of the year is a DNF, how fun. I really wanted to like this. I read dawns previous book last year and felt super disappointed but I know that sometimes you have to be in the right mood for certain poetry (or poetry in general), so I gave this book a try. And sure there were some okay poems that I didn’t dislike, but nothing blew me away. Nothing touched me or spoke to me. The way she writes just doesn’t work for me. I just don’t ever fully connect with it. So I think And the first read of the year is a DNF, how fun. This collection of poems only grew stronger the more I read it. These are highly relatable poems about heartbreak and loss and healing and depression. Many of these poems are empathetic, and some are extremely, extremely poignant. Lanuza understands what it's like to sleep too much, to sleep not enough, to grasp for control and comfort and affection and not obtain it. My favorite poems from this collection include "Plans," "A Silent Prayer," "Honey Sweet," and my absolute favorite, "Off With This collection of poems only grew stronger the more I read it. These are highly relatable poems about heartbreak and loss and healing and depression. Many of these poems are empathetic, and some are extremely, extremely poignant. Lanuza understands what it's like to sleep too much, to sleep not enough, to grasp for control and comfort and affection and not obtain it. My favorite poems from this collection include "Plans," "A Silent Prayer," "Honey Sweet," and my absolute favorite, "Off With Your Head." She understands the need to write, the need to heal, the need to recuperate. So much of this collection is based off of understanding (if you couldn't tell! ), and that makes it all the more accessible. Design-wise--look at that cover! It's cute, fresh, and absolutely contemporary. Allow this book to fall into your hands. 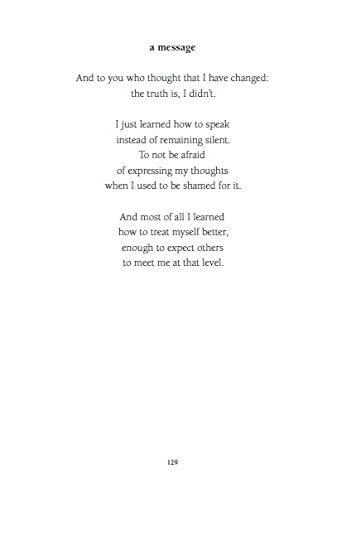 Allow yourself to read it and to love it and to heal. You'll thank yourself for it. This would be a book that I would maybe recommend to older high school students, not something I would suggest for younger students. I think I read this collection of poetry in a time that this book really hit home. I have a feeling this will be a book that I pick up as a physical book once it is released and pick it up whenever I need to feel like I am not alone. I only recently started reading poetry, and there have been some poems and poem collections that I have read that I just do not under This would be a book that I would maybe recommend to older high school students, not something I would suggest for younger students. I think I read this collection of poetry in a time that this book really hit home. I have a feeling this will be a book that I pick up as a physical book once it is released and pick it up whenever I need to feel like I am not alone. I only recently started reading poetry, and there have been some poems and poem collections that I have read that I just do not understand, but this book was written in a way that almost seemed like it was written for me. I think that most people that pick this book up will also have a similar feeling. Even if you do not directly relate to the stories or events that are being explained or described, I think that people will still be able to make connections. Lanuza is a talented writer and I enjoyed her ability to share her feelings in such an artistic and thoughtful way. She shared deeply powerful messages in poetry format and although there was a lot of sadness there was also a lot of self-love and hope. This book covered a wide array of issues including rocky past relationships, loss, body image and suicide ideations which may be triggering for some. Thank you to NetGalley and Andrews McMeel Publishing for giving me an opportunity to read this. A Lanuza is a talented writer and I enjoyed her ability to share her feelings in such an artistic and thoughtful way. She shared deeply powerful messages in poetry format and although there was a lot of sadness there was also a lot of self-love and hope. This book covered a wide array of issues including rocky past relationships, loss, body image and suicide ideations which may be triggering for some. Poetry books are always a hit-or-miss thing for me. And for this one, I liked it. I do admit that I struggled in the first part of the book. The poems just weren't connecting to me. But when I read the middle and last part of the book, that's when I thoroughly immersed myself in the poems. My favorites are doomsday prepper & the art of eating alone. These poems really spoke to me. "These lives we could have lived? The first section of You Are Here has a deep longing sadness running through every word that transitions into a sort of melancholy healing in the second and third sections. This book explores self-love and relationships with very elegant writing. This book was one of the best poetry books I have ever read and I have read a lot. I really liked the cover too which is what drew me into checking it out. The writing style is amazing and the poems make me feel happiness and are inspiring for me. I relate to some of the poems too. I look forward to reading more from this author. I get that I'm a jaded kind of gal, but there was so much good here with feminist statements and chronic pain talk, but it focused way too much on the love of a man. *barf* I would definitely read more from this author, but sadly this collection wasn't for me. This book was provided by the publisher through Netgalley in exchange for an honest review. Thank you Andrews McMeel Publishing and Netgalley! You Are Here is a beautiful poetry collection about love, relationships, self-reflection, … This is the second poetry collection I’ve read by Dawn Lanuza. I think that You Are Here is such a good poetry collection and I really liked reading about different topics. I think that these poems are really well written and some of them are really beautiful and relatable. you’ve got standards, so what? You Are Here is a poetry collection. I did enjoy reading these, but I'm more a fan of poetry of the natural world. If this is your favorite type of poetry you should enjoy this collection. Thanks to NetGalley for an arc in exchange for an honest review. Dawn Lanuza does it again! I really enjoyed reading this beautiful collection of perfectly written anecdotes! Though I do prefer her previous work, the poem titled “the museum of unfinished things” made me pause. And I read that page again. And again. And again. Thank you Dawn Lanuza, and thank you Netgalley for this eARC. You Are Here was a good read. My partner and I recently broke up and some of the poems were definitely relatable. It was really heartbreaking, sad, but at the same time, it reminds me of how much I love him despite what happened. I loved that this collection promotes self-love/self-care cause that's what I'm doing now, focusing on my self -- healing. One of my favorites is "staying is your choice". but I don’t know a thing about having. It's described as a collection about self-healing and giving ourselves second chances. Although I can definitely see the latter as a running theme throughout the poetry, I was really hoping for more about the self-healing aspect. That's not to say this wasn't a good collection - you can definitely see the raw emotion and experiences as an undercurrent to Lanuza's poetry, and it makes for many wonderful pieces which I did enjoy. This is the poetry book for every college broken heart. It made me remember those feelings so clearly, and the message of moving forward was well aimed. "Who made you believe that you were hard to love?" Thank you to NetGalley and Andrews McMeel Publishing for this lovely poetry collection, in exchange for an honest review. If you ever want to feel understood by a poetry collection, this book is for you. It shows you what it is like to go through heartache, starting over, second chances, the internal struggles a person can encounter throughout their life, and a daily struggle of self-love. There are some I didn't quite connected with and weren't treasured prose, but quite a few felt familiar and I could relate through personal experiences. This book was a breeze to read. I finished in half an hour, and although it's a quick read, the words and the heartache lingers in your thoughts and heart. You are reminded of your first love and how it tragically ended, how you feel like you will never find a love like that again, and how somehow one day, you will wake up and finally understand what it is to love yourself and appreciate what you have now. 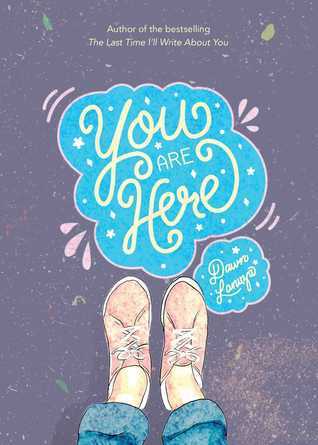 You are Here by Dawn Lanuza isn't a book I would recommend to everyone, but there are very specific people I would recommend it to, for example, a young woman going through loss and has a difficult time getting back to her old self or maybe how to find herself again. There are many that are looking for 'popular' poets with their heartfelt and trendy prose, but you should give this collection a shot. Dawn Lanuza writes contemporary romance, young adult fiction and prose poetry. She has two first loves – music and writing – and is lucky enough to surround herself with them. She currently lives with her family and a very loved cream toy poodle. She sometimes blogs at dawnlanuza.com. When did the story change?